Head of Minerve 1st titre for 950/1000 French sterling silver guarantee. The set includes six glasses in sterling silver and Baccarat cut crystal and a whiskey or aperitif decanter in sterling silver and Baccarat cut crystal. These pieces are unmarked, made prior to the acid-etched mark first used by the firm in 1936. Baccarat’s craftsmanship is apparent from every angle, as the architectural form creates extra visual dept. The diamond-cut stopper crowns the decanter with sophistication. No monograms. The service seems to have not been used. 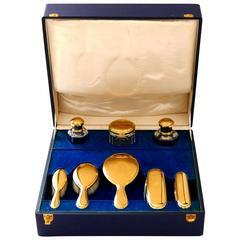 An exceptional set from the point of view of its design and particularly the quality of the crystal. A set for connoisseurs. Baccarat The French luxury brand Baccarat is considered the most famous glassworks in the world Founded in 1764 by decree of King Louis XV, the crystal symbol of Art de vivre a la francaise has attracted over the centuries great personalities like Louis XVIII, Tsar Nicolas II, the Maharajas or Prince Rainier. The pieces - stemware, chandeliers, candlesticks, vases, bottles of perfume or jewelry - are created for 250 years by glassblowers, cutters, engravers and gilders, an elite consisting especially of a Master of Art and the 22 best workers of France. Measures: 3.35 in (8.5 cm) glasses height. 10.24 in (26 cm ) decanter height Weight: 2820 grams. The condition is very good to excellent for this set. Crystal is intact, no repairs, no chips or cracks. No deposit on the decanters or glasses. A master silversmith made a complete cleaning and polishing. 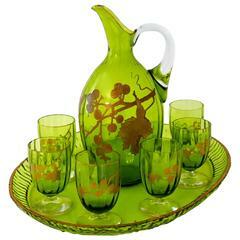 Exceptional in both design and execution, this fabulous set will grace your table and will delight your guests. Shipping and Insurance Information: Sales only by shipment. Shipping worldwide with Priority Package Express International. We deal with original genuine antiques over 100 years old. This set is not subject to import tax to the US. We ship purchase Mondays through Friday (outside French holidays) paid items will be shipped on the first shipping day after payment is received. After registration of your order and confirmation of your payment, your order is prepared and packaged with the utmost care to ensure you receive the items in perfect condition. Your package will be insured for the total value of your purchase (s). Tracking numbers (French and international) of your package will be sent by e mail to track your package online on the French website then on the website of postal service in your country. The condition is very good to excellent for this set. Crystal is intact, no repairs, no chips or cracks. No deposit on the decanters or glasses.